London limners may have led the pack, but the great provincial cities were not far behind. To make the point, here are three fine Birmingham prints, all drawn and published by Edward Rudge of that city. (Click to enlarge .) 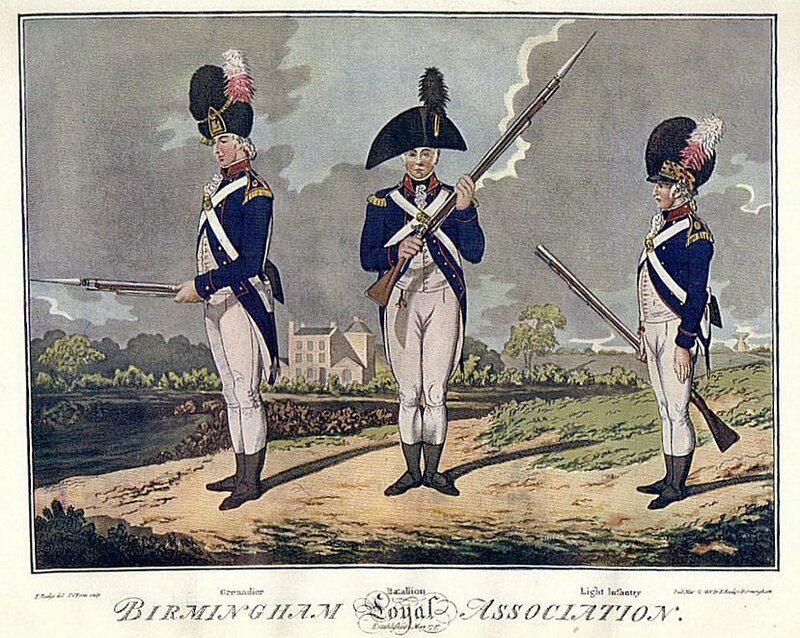 Two show the battalion and flank companies of the Birmingham Loyal Association of 1797, and both were engraved by Samuel William Fores, better known as a publisher of Gillray and others. In April 1799 the Association appeared for the first time “completely regimented” with a grenadier and a light company; “… handsome and military … much admired …,” said the local papers. In September Rudge’s print appeared to memorialise the whole handsome effect. The difference in height between the men of the companies is emphasised in his visualisation. Birmingham Museum and Art Gallery has a copy of this print, and reproductions were published for the Matthew Boulton exhibition of 2009. A more animated and fluent version, again by Rudge and Fores, appeared in March of the following year, no doubt to satisfy continuing popular clamour. A rather noble house and a small lake appear in the immediate background, with a windmill in the distance on the extreme right, but I can’t say that I’m able to identify the location. This second print is reproduced in Hart’s 1906 history of the 1st Volunteer Battalion of the Royal Warwickshire Regiment. Space precludes any analysis of the uniforms here, but it may be worth mentioning that a fine grenadier private’s coat, with waistcoat, breeches and accoutrements, and a light infantry Tarleton are on display at the Royal Warwickshire (Royal Regiment of Fusiliers) Regimental Museum in Warwick. The third Rudge print dates from April 1801 and was engraved by a C Williams rather than by Fores. This fine piece of aquatinting is dedicated to the Warwickshire Yeomanry Cavalry, raised in 1794, and shows what seems to be the second uniform of the regiment, with a skirted “Austrian” jacket. 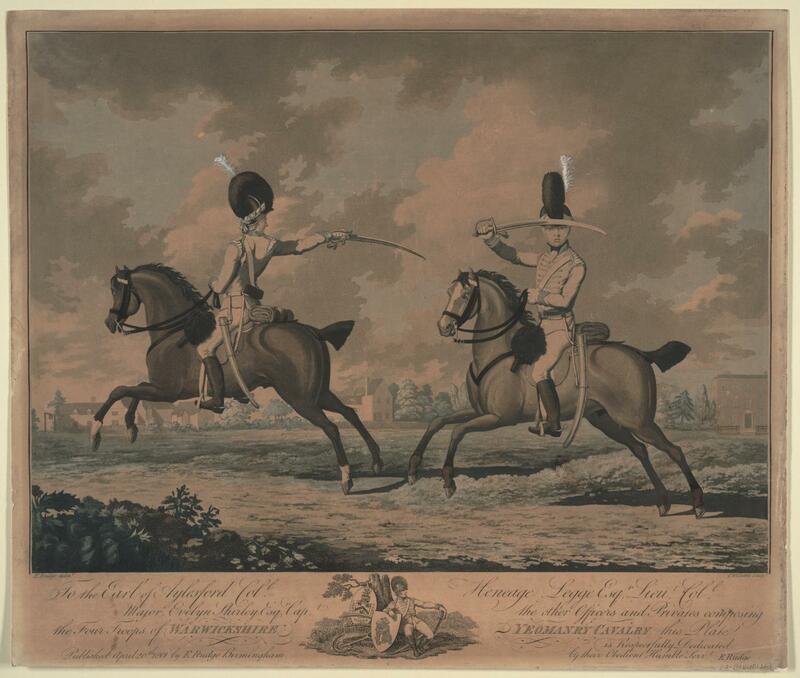 The print is reproduced in Adderley’s very scarce regimental history, but a good high res version is available at the Anne S K Brown Collection. In his Ogilby Trust pamphlet on the regiment, the late R J Smith lamented that variant colourings of this print obscure the history of the uniform, but it seems clear to me that a French grey jacket with green facings and yellow braid is shown. On the Anne S K Brown copy (alone?) a white over red feather has been added to the helmet. This entry was posted on Sunday, August 30th, 2015 at 5:29 pm	and tagged with Birmingham, Birmingham Loyal Association, Birmingham Museum & Art Gallery, Edward Rudge, J W Fortescue, Matthew Boulton, prints, R J Smith, Royal Regiment of Fusiliers Museum, Royal Warwickshire Regiment, S W Fores, Warwickshire Yeomanry and posted in armed associations, grenadiers, light infantry, Napoleonic, uniforms, volunteers, yeomanry. You can follow any responses to this entry through the RSS 2.0 feed. Any idea if the drums and fifes of the infantry wore reversed Colours? 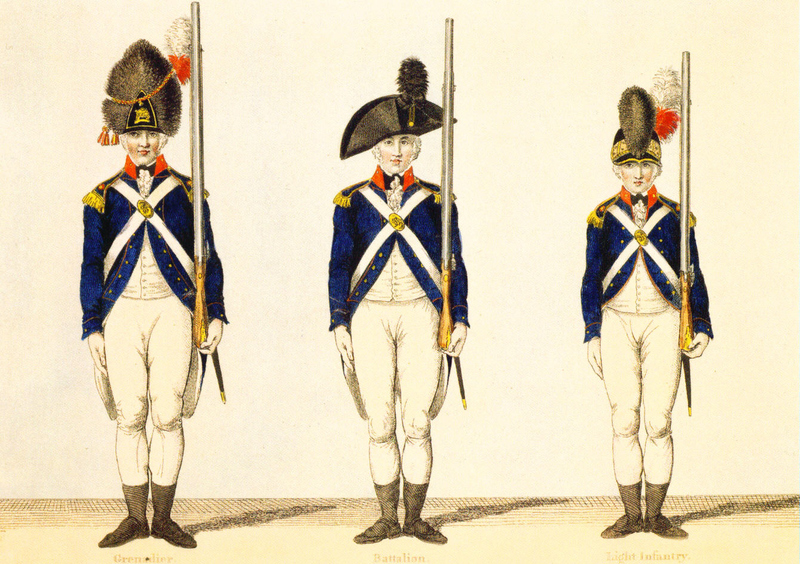 In this case red faced blue.The Dublin Volunteers of about the same period seem to wear buff faced red with cocked hats, while the infantry wear a similar uniform to the Birmingham Loyal Association. I’ve found no evidence for the Birmingham Association musicians, but reversed colours would seem to be the default probability. As, to give just one example, the Loyal Independent Sheffield Volunteers of 1794, in blue faced scarlet, musicians reversed – details on my West Yorkshire 1790’s volunteers page which you should be able to spot in the menu in the right margin.